Fly Agaric is a member of the is a member of the Amanitaceae Family, a family of mushrooms that includes both edible mushrooms, and some of the most poisonous (including the Death Cap). The mushroom has a convex top (also called a pileus) which flattens as it ages, growing from 3-10 inches in diameter. The underside of the pileus consists of white, closely spaced gills. The cap is typically bright red in color with white warts and a white stem that grows from 3-7 inches in height. Fly Agaric is eaten some parts of the world because it can induce hallucinations. However, this species also contains a number of toxins that can be fatal if present in sufficient quantity. Several deaths have been attributed to this species in the US. 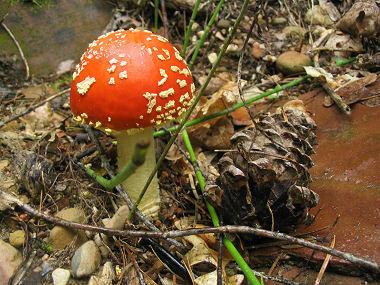 In the southwest, Fly Agaric typically grows in moist pine woodlands. The mushroom reproduces by means of white, dust-like spores which are dispersed by the wind.